The introduction of hand-cranked sewing machines around 1900 revolutionized Seminole clothing design and prompted women to begin experimenting with strips of colorful cotton fabric bought at local trading posts. 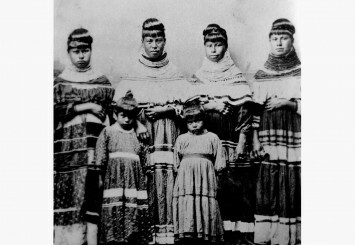 Working in their remote camps in the Everglades and Big Cypress, by about 1916, Seminole and Miccosukee women had developed a new and distinctive style of clothing known as taweekaache or patchwork. To make patchwork, different colored cloth is first torn into strips and then sewn together to make long bands of geometric patterns and designs. These strips are then joined horizontally to other bands of colored cloth to assemble the body of the garment. The most complicated designs need to be cut and re-sewn many times. According to one local story, Seminole Indians who guided the advance clearing crews during the Tamiami Trail's construction often collected the surveyors' colored cloth streamers at the end of the day to use in making patchwork clothing. Patchwork is still a source of cultural pride and identity to the Seminole, and a product of great commercial value. Designs are never written down and new patterns are still being created. To learn more about the Seminole Indians, their culture and their museum, visit www.seminoletribe.com.